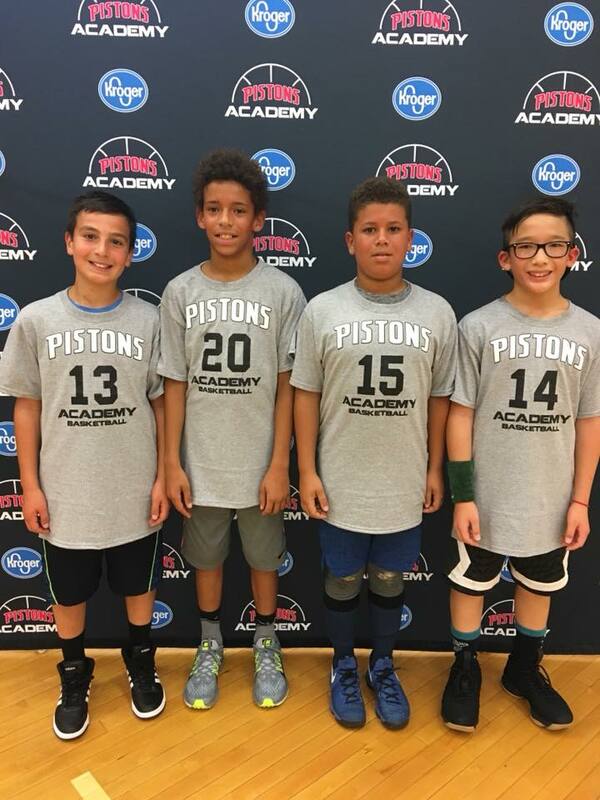 The fall 2018 season of our Pistons Academy premier leagues, presented by Kroger, got off to a great start over the weekend in Birmingham and Southfield. Stats, standings and game recaps will be posted weekly. FALCONS 20, RAVENS 14: Luca Spadafore netted 8 points to lead the way for the Falcons as they secured the opening-weekend victory! Isaiah Mahdi posted 8 points and 5 rebounds to go along with CJ Brown’s 6 points for the Ravens (0-1). Zackary Kozouz (6 points) played well and the trio of Manuel Calderon, Kannon Shore, and Parker Rost each added a bucket for the Falcons (1-0). CHIPPEWAS 28, BRONCOS 24: The Chippewas (1-0) started the season off on the right foot as they defeated the Broncos (0-1) in a close game. Led by Aaron Robinson’s 8 points, as well as 7 points apiece from Taylor Vance and Henry Weiss, the Chippewas sneaked out the momentum-building win. For the Broncos, Eoin Papanikolas scored 7 points and Tejas Sabnis added 6 points. HUSKIES 31, SPARTANS 19: A hot start to the game saw the Huskies (1-0) jump out to a 16-6 halftime lead. They were paced by Chase Kukes’ 11 points and never relinquished their lead as they took care of business against the Spartans (0-1). Jonathan Schwartz scored 6 and Mikias McKinney dropped in 7 points for the Huskies. Landon McKinney (6 points, 5 rebounds) led the way for the Spartans, who will look to bounce back in Week 2. WOLVERINES 29, HOOSIERS 24: The Wolverines exploded for 20 first half points, including 6 from Wally Ulmer, and established an 11-point lead (20-9) at the half. Behind a game-high 15 points from Drew Heckman, they were able to hold off a second-half rally from the Hoosiers. Aiden Binder (7 points) and Cole French (6 points) led the way for the Hoosiers, along with the strong guard play of Quran Creary. WILDCATS 30, HOYAS 18: Playing shorthanded and without any subs available, the Hoyas (0-1) put up a tremendous fight against the talented and well-balanced Wildcats (1-0). Eli Yen score a game-high 13 points and his teammates (Landon Smith, Maddox Smith, Evan Sachs) all played with great effort as they kept this one interesting throughout much of the game. Eventually, Chase Chaldecott (11 points) and the Wildcats pulled away, outscoring the Hoyas 18-4 in the 2nd half. WARRIORS 31, BULLS 18: Ben Rosenfield (8 points, 6 rebounds) and Abe Miller (6 points) led the Warriors to the season-opening victory over the Bulls (0-1). Jalen Palmer scored 7 points and Luke Thurswell added 4 points for the Bulls, who will look to find a rhythm on offense in Week 2. TROPICS 39, SPIRITS 31: The Tropics (1-0) overcame a 5-point halftime deficit to beat the Spirits (0-1) on Saturday afternoon. Sam Kramer was solid with 17 points and Bryan Thomas added 10 points for the Tropics, as they used good ball movement and pushed the ball up the court nicely. Brandon Talley led the Spirits with 15 points. CELTICS 47, BLAZERS 18: The Celtics bolted out to a 26-5 lead at halftime and never looked back as they cruised to victory. A much more competitive 2nd half saw the Blazers play better and begin to find a rhythm on offense. Xavier Lane scored a game-high 14 points and Steven Clippert added 11 points for the Celtics (1-0). The Blazers (0-1) were led by Ryan Hanks (6 points). SONICS 51, BULLETS 38: Jacob Bylinowski scored a Legends Division record 26 points, including 8 three point field goals, as the Sonics (1-0) opened the season with a win. The eight 3PM also set a new Legends Division record. The Bullets had no answer for his hot shooting, as they struggled to keep pace in the high-scoring contest. Dylan Dembs scored a team-high 14 points for the Bullets (0-1).